Multiple necklace style options are available here which incorporate a handcrafted arrowhead made to your specifications. Matched to this necklace is a pair of earrings with your choice of backing. Since these are Custom Hand-made there can be a delay of up to a month in fulfillment. Selection of "Artist's Choice" under the options provided can reduce this fulfillment time significantly. 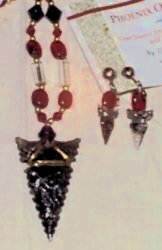 A Metal Arrowhead charm of your choice is added to a necklace with a matching pair earrings. 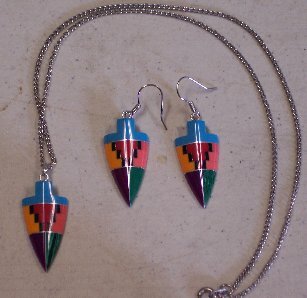 Also available here are other types of Arrowhead Charms, like Hematite or Slate, on Necklace and Earring Sets. A variety of other necklaces with matching earrings are available from Phoenix Obsidian Designs. 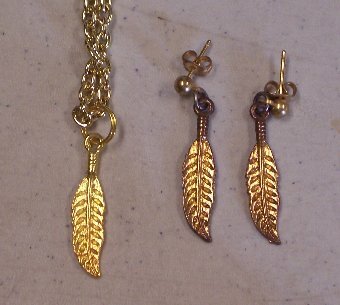 Found here are Bullet, Feather, and Tooth Necklaces as well as many other unique charm options - all matched with a pair of earrings with your choice of backing. Copyright © 2018, Phoenix Obsidian Designs.